The CarbSmart Grain-Free, Sugar-Free Living Cookbook is chock-full of sweet recipes that please the palate and leave you feeling great–without gluten and sugar! 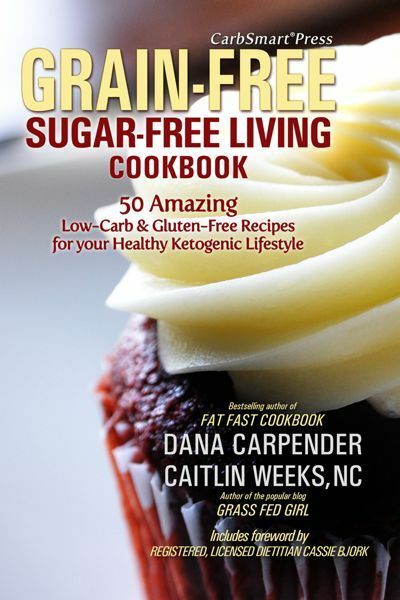 Two people known for and dedicated to the low-carb and Paleo lifestyle–Dana Carpender and Caitlin Weeks–have created these wonderful grain-free, sugar-free recipes. Carpender is the author of 20+ low-carb cookbooks including our Fat Fast Cookbook, while Weeks, known as Grass-Fed Girl, is a holistic nutrition consultant and popular blogger from San Francisco, CA. These CarbSmart.com columnists have collaborated on an amazing collection of recipes that you’ll want to make over and over.